You could say it like this, but this is supported by the show on-screen in the movie In the Beginning; Dukhat says "with who's authority?!" when he's informed that they are approaching the humans with gun ports open. It's clear that he didn't think the warrior caste tradition was always the best way to go. Last edited by JoeD80; May 22nd 10 at 15:48. I find it interesting that Alisa gets away from the Psi Corps. Ivanova says to Sinclair at one point that she thinks there might be other options for Alisa as long as they can keep her under their (B5) jurisdiction long enough. How does that work, exactly? Babylon 5 is Earth jurisdiction, isn't it? Minbari War Cruisers are gorgeous! Not "big and ugly", but then, I didn't just fight a war against them. 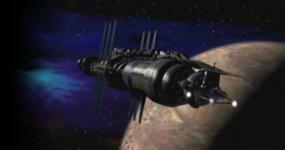 It's taken me a couple decades to appreciate that aspect of Babylon 5. Ten years seemed like a very long time when I was young. It doesn't, now. I think I say this every time there's a Warrior Caste Minbari on screen, but damn those robes are cool. Stomach pumping of the Pak'ma'ra. How can this be legal? How did Delenn have that body cremated? Is there a cremation facility on B5? Did she take the body off-station? Sinclair and Neroon stand REALLY close together when they talk to each other. I'm starting to think this must be a Minbari thing, as there's similar conversations in other episodes.